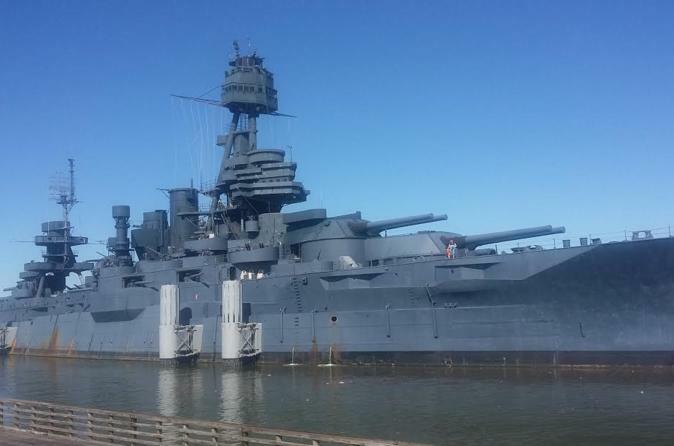 A 1.5 hour history/ sightseeing tour guided by a Certified Tourism Ambassador in climate controlled vehicle proceeds trip to The "USS Texas," once considered the most dangerous weapon on Earth. It was armed with over 70 high caliber weapons and some of it's artillery capable of hitting targets up to 12 miles away leaving a hole 10 feet deep - the size of a basketball court. You'll see how these brave men lived life while on the high seas from Okinawa to Iwo Jima and hear the amazing journey of battleship "Texas" and it's history. Afterwards you'll visit the tallest stone memorial in the world which is San Jacinto Monument and stands 570 feet tall. You'll also visit the San Jacinto Battleground where an army led by General Sam Houston defeated Santa Anna's Mexican Army for independence from Mexico. You'll visit the actual battle site as well as the San Jacinto Museum that sits on 1,200 acres of meadow. Complimentary bottled water, snacks and hotel pickup. Free souvenir. This tour of approximately 6 hours begins with complimentary pickup from your downtown Houston hotel, loft or business. For approximately 1.5 hours, you'll tour landmarks and attractions such as Minute Maid Stadium, Toyota Center, Allen's Landing, Market Square, City Hall, Buffalo Bayou, elaborate River Oaks, Discovery Green, and more before the 30 minute transfer to the State Park in La Porte, TX. which is home to Battleship Texas, San Jacinto Monument and San Jacinto Museum. Your guide will help you navigate your way through the battleship to areas such as the lower deck, kitchens, barracks, barbershop, commissary, captain's station and more for the next 1.5 - 2 hours allowing opportunity for rare and amazing photos. Have a quick lunch at the outside snack bar on site before going across to the monument marking the spot of the war for independence and freedom for Texas from Mexico and hear the story of how a small volunteer army slaughtered the well trained troops of Mexican General Santa Anna in an 18 minute battle that made this land called Texas. This tour often has surprise stops from the Ambassadors "Hidden Treasures' when time permits. Afterward you can browse artifacts in the San Jacinto Museum before return to Houston. A minimum of 2 bookings is required for this tour.